Agnes Gonxha Bojaxhiu, popularly known as Mother Teresa was an Albanian-born Indian Roman Catholic nun. Mother Teresa was born on 26th August 1910 in Skopje, Republic of Macedonia. Her father's name is Nikola Bojaxhiu and he is an Albanian politician . Her mother's name is Dranafile Bojaxhiu. In childhood itself she started to read many stories books related to Missionaries and services. At the age of 12, she interested and commit herself to a religious life. she left home to join “Sister of Loreto” as a missionary at the age of 18. After she left home she never saw her Mother and her Sister. Intially she went to Loreto Abbey to learn English for Teaching school childrens in india. Agnes first visit to India on 1929, for the purposes of give education to poor children in St. Teresa’s School at Darjeeling, near the Himalayan mountains and she learned Bengali there. 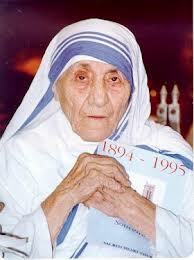 In 1931, she changed here name as Teresa due to saint of missionaries. In 1937, she came to Eastern Calcutta for serving as Teacher and after years passed, in 1994 she appointed as Head Mistress. In 1947, she leave the convent and planning to help poor people among as in Calcutta. In 1948, she started the Missionary of services and her life style is simple and in traditional Loreto Habit. she wear a simple white Cotton Sari decorated with blue border. In Patna she get a Basic Medical training in the Holy Family Hospital. In 1949 ,a group of young women joined with mother Teresa and laid a foundation to create a new religious community for helping "poorest among the poor" people in Calcutta. In 1952, she opened the first home for the Dying in space at Calcutta. The property of the land belongs to Hindu and some Indian Officials involved for converting “Hindu Temple into Kalighat Home for Dying”. In the year 1990, over one million co-workers join all over the world in “The Missionaries of Charity”. Mother Teresa started with 13 sister and laterit grown as 4,000 sisters and able to run an orphanages in the year 1997.
she also stated once, "By blood, I am Albanian. By citizenship, an Indian”. First Pope John XXIII Peace Prize in the year 1971. Nobel Peace Prize in the year 1979. In 1997 5th Septmber, she died because of heart attack and her last word is “I can’t Breath” and died. On 13th september 1997, her funeral was held.